The story of life and death for teen fighters living in a brutal dictatorship is the number one movie in America this week after breaking box office records with the biggest opening weekend for a non-sequel. Grossing over $155 million its opening weekend, The Hunger Games over performs with a massive following that puts it in third place behind last summer’s final installment of the Harry Potter series which debuted at $158.4 million and The Dark Knight which debuted at $169.2 million, according to The Los Angeles Times. But those other two movies were sequels. They had established fan bases. 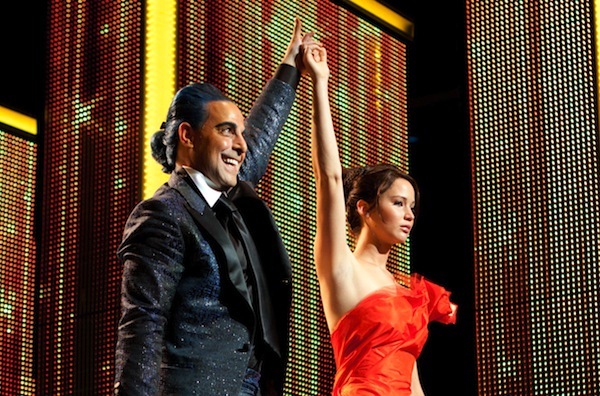 The Hunger Games is the first in what many hope is a very lucrative series for the book-turned-action film. This is more than double the numbers for the first Twilight film, which opened with $69.6 million in 2008. Looks like the Twi-hards have got some competition. Coming in a very distant second is last week’s number one, 21 Jump Street with $21.4 million, which isn’t a bad number at all, unless you’re standing next to Katniss. Sorry Jonah and Channing, girl power whooped your booty this week. The reprise of the famed Johnny Depp TV series had fans laughing and applauding the remake. Previously number one for two weeks in a row, The Lorax fell to number three this week with an estimated $13.1 million at the box office. The story of saving the trees won hearts and minds among family film-goers. Disney’s disaster John Carter managed to stay semi-afloat at number four with $5 million. The Civil War soldier who travels to Mars and gets mixed up in a conflict didn’t grab audiences the way filmmakers had hoped. Coming in fifth place this week was Act of Valor, the story of a CIA agent who is rescued by a group of Navy SEALs. The action film earned $2.1 million at the box office. The teen movie about partying until you drop, Project X, came in sixth place with an estimated $2 million. Another disappointing contender was Eddie Murphy’s A Thousand Words ranking number seven this week with an estimated $1.9 million. The story of a book publisher who can’t speak or he’ll die didn’t win over audiences as much as it might have if Eddie Murphy was allowed to speak. Isn’t that what he does best? October Baby, the story of a college girl who discovers she’s the survivor of an attempted abortion, came in eighth with $1.7 million. Rounding out the top 10 were Safe House, which earned $1.4 million bringing it in at number nine and Journey 2: The Mysterious Island, which also earned $1.4 million bringing it in at number 10. Look out next week’s releases — The Hunger Games is on the prowl.